The ability to share medical images is a key component of modern medical care. Typically, radiology departments managed that task through PACS (and CDs outside the system). As more facilities adopt vendor-neutral archives (VNAs) for enterprisewide archiving—and to reduce the future need for costly and time-consuming data migrations—VNAs are beginning to shoulder more of the image-sharing burden. Although there still is a lot of work to be done before facilities can completely retire PACS’ archiving function, health care providers are moving in that direction. The State University of New York (SUNY) Upstate Medical University in Syracuse installed TeraMedica’s Evercore VNA in September 2012. One reason that SUNY decided to implement the VNA was to enhance life cycle management of DICOM and non-DICOM clinical images. A single repository simplifies the process more than combing through a series of departmental PACS. Another reason for the implementation was to image-enable its Epic Univision EMR interface, which was being installed at the same time, according to Steve Roberts, director of host systems administration for SUNY Upstate Medical University. With the two systems linked, anyone with access to a patient’s chart could access medical images directly from the VNA, reducing the need for separate PACS workstations. But with approximately 1,500 potential users across the enterprise, efficiency was a necessity. One advantage of simultaneously implementing these systems was that workflow could be reengineered with less disruption. Roberts says SUNY clinicians were using their PACS as their archive prior to the implementation, viewing images directly from the PACS. Enabling image access through the EMR made workflow easier. Radiological images are stored in DICOM format, but to maintain clinical speeds, the Evercore VNA creates a JPEG reference view of the stored images. EMR users can access the reference view by clicking an Epic image link that routes to the VNA viewer, which facilitates the majority of image views in the system, according to Roberts. If the user wants to see the DICOM version, however, he says there is a link embedded in the VNA viewer that connects directly to the PACS and opens the proprietary viewer of the PACS system at the EMR interface. Once the system went live, Roberts’ group e-mailed a how-to document to users—the only training needed. However, as with any technology implementation, there were some challenges. The first hurdle was making sure that SUNY and its vendors were speaking the same language. When the project was initiated in 2010, there was even less agreement about what constitutes a VNA than there is today. Jeff Kline, the university’s manager of information management and technology for radiology and data management who oversees SUNY’s VNA, says that back then some PACS vendors claimed to be VNAs and others claimed to have a VNA solution. As time has passed, though, he says more vendors are adapting to working with VNAs that truly are separate from PACS. There also are access issues that need to be addressed. Because clinicians now have access to a much broader range of documents, privacy is an even bigger concern than before. Certain types of imaging files are more sensitive than others, and deciding who needs access can be a challenge. Although all physicians sign agreements that they’ll look only at necessary files and the EMR can track who accesses the files and when, the balance between access and security is still evolving. Roberts hopes to have a governance committee instituted to examine questions about release of information procedures and other policy concerns. On the technical side, setting up the interface between the VNA and the EMR and generating orders from SUNY’s hospital information system were two large challenges. Since the VNA and EMR were new, there was a lot of trial and error involved in developing strategies for building URLs, identifying records, and sending out image notifications. Because the VNA uses more quality assurance protocols to associate an image with a medical order than SUNY’s PACS does, it took some time to build an order set that sent an image notification to the EMR at the appropriate time. Once the order set was built, Kline says things went more smoothly, although SUNY is still resolving some order set issues for nonradiology data. Since the VNA went live, archiving SUNY’s legacy data has been an ongoing project. Roberts estimates there was 112 TB of data to store, and SUNY is about halfway through the process. In six to 12 months, the archiving will be complete. 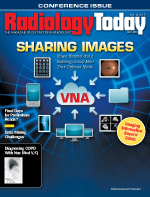 Sharing images over a hospital enterprise is one way to use VNAs, but radiology groups that read for multiple sites also are using them to connect with clients. Jefferson Radiology in East Hartford, Connecticut, reads exams for seven hospitals and offers subspecialty services, advanced imaging analysis, and 3D services. Jefferson has radiologists reading remotely in California, Florida, Massachusetts, and Pennsylvania as well as on-site radiologists at the local hospitals to cover interventional procedures. In many cases, a Jefferson radiologist is the hospital’s radiology department chief. To alleviate workflow problems caused by using different PACS at different sites, Jefferson decided to convert its radiologists and sites to Intelerad’s PACS and implement a TeraMedica Evercore VNA for archiving. Stage 1 of Jefferson’s implementation also consolidated voice recognition capability on Jefferson’s server so that everyone reads from the same worklist. To maintain privacy and security, Jefferson sets up each hospital as its own organization within the VNA. Mike Quinn, IT director and chief technology officer for Jefferson Radiology, says he expects to have more hospitals converted to Jefferson’s environment by the end of this year. Reengineering the workflow required part cyberskill and part salesmanship. Prior to their current PACS, many hospitals had systems that produced data that weren’t as structured as they needed to be. Modifying those data to make them interoperable was a big challenge. Jefferson worked with the hospitals to clean up their imaging data and put the images’ DICOM headers in the appropriate format. To expedite that process, TeraMedica helped them develop scripts that would enable the VNA to organize the data. Once the initial connection is made, the system generally runs well. But Jefferson also had to sell the hospitals on the new workflow. Quinn says the hospitals’ biggest concerns were security and value. Because each hospital is set up as its own entity within the VNA, Quinn says their data are as safe as if they were hosted on the hospital’s server. At the same time, health care reform is affecting state budgets, which in turn affects hospitals’ budgets. Jefferson’s ability to provide subspecialty reads and augment staff, especially at smaller facilities, can help hospitals manage costs. In addition, the VNA allows Jefferson to match data from a patient who may have been seen at one of Jefferson’s clinics or another hospital that Jefferson reads for, providing a more complete picture of the patient’s medical status. As Jefferson moves toward stage 2 of its implementation, the organization is looking to image-enable the EMRs of the hospitals that use their PACS services. Although the timetable is fluid, Quinn thinks stage 2 may get under way by the third quarter of 2014. He says Jefferson will probably reach out to one of its hospital partners later this year to start compatibility testing as a first step toward implementation. The amount of work that needs to be done will depend on the upgrades required as the VNA goes through the certification process needed before it can link to an EMR. It also will depend on how the EMR vendors handle the image enablement process and how much information Jefferson needs to provide to them. At a minimum, some data cleanup will be necessary along with DICOM header work. Quinn says it also will be important to determine the minimum viewer capability EMR users desire because that’s usually the biggest concern. Looking further ahead, Quinn says Jefferson is on course to link with health information exchanges (HIEs). Connecticut has been working on a statewide HIE for more than a year, and Jefferson initially was part of the technical team. Although the organization is no longer involved with the project, Jefferson has kept in touch with the people who are setting up the HIE to ensure that it understands the requirements. Quinn says Jefferson also is preparing to participate in private HIEs with its hospital partners. The organization soon will begin talking to hospitals about potential collaborations. He believes the increased connectivity will result in better reads and better patient care.